"In the dark beside me, she smelled of sweat and sunshine and vanilla, and on that thin-mooned night I could see little more than her silhouette, but even in the dark, I could see her eyes - fierce emeralds. And not just beautiful, but hot too." Looking for Alaska was an impulse buy after my friend fanboyed at me for a good half an hour about it. The conversation ended with him saying "you should buy it" and me buying it, because I don't give in to peer pressure at all. Nope. Never. To be honest, I wasn't sure I would like it, despite having loved all of John Green's other books, but I ended up being pleasantly surprised. I really don't know why I hadn't expected much, but it turns out my friend was absolutely right: this book is stunning. It almost reminded me of a Rainbow Rowell novel because the writing style was so similar, and I fell in love with the book instantly. The foreshadowing, the setting, and the people were just brilliant. I even loved the ending, and you know how hard I am to please when it comes to book endings! Another thing I loved about this book is that Alaska is a huge bookworm, and she reminded me of myself a lot of the time, especially her bedroom which consisted of her 'Life's Library' - stacks and stacks of books covering the floor and lining the walls. If I remember correctly, I'm pretty sure my exact thought at that point was "Why is my room in this book?" Then there was Miles. Everyone knows characters are generally supposed to develop throughout the book and experience new things or learn from mistakes, but a lot don't, and we all know how irritating that can be. Luckily, this wasn't one of those times. I loved Miles' friends, Colonel and Takumi, too. I thought when it was mentioned that Miles would have a roommate that he would have to live with some evil, manipulative bully because that's usually the way these kinds of stories go, but John Green, thankfully, did his own thing as usual, and the fact that Miles' roommate wasn't some frustrating bully was a refreshing turn of events. All in all, I'd say this is John Green's best book; yes, even better than The Fault in Our Stars. This is about friendship, death, and learning to live with the rubbish life can throw at you, but also learning to appreciate every good thing, no matter how small or seemingly insignificant it may be at the time. I'm so glad I read it and if you haven't then you should too, because this may be the most underrated of his books but it's definitely the best I've read in a long time. I read this one right after reading Paper Towns and I thought the two stories were very similar. I have read this book so many times, I love it! I've only read John Green's Will Grayson, Will Grayson and The Fault in Our Stars. I really loved both of them, but I haven't gotten around to reading his other books because I've been trying to give some other authors a chance :) But I've heard too many wonderful things about Looking for Alaska to neglect it anymore. Thanks for the review! After reading three of John Green's books, I've decided that I really struggle with his writing. The Fault in Our Stars is one of my all time favourites - but probably because I found it very relatable. Paper Towns was great but not on the TFiOS level. 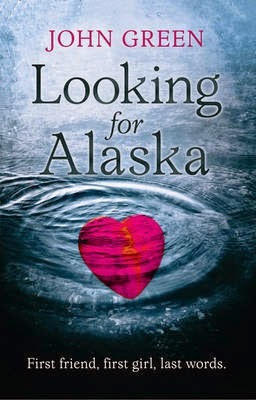 And Looking For Alaska sadly wasn't for me - I really wanted to like it but had so many problems with this that I won't warm to it. My absolute favourite John Green book! (and the first I ever read) Still keeps me up all night, even on the tenth re-read!! I'm so happy I read this review! I've been pondering whether or not this is book is a good choice to read. I'm doing an assignment for my English class and I wanted a book I would enjoy and that would earn me credit. On the credit part this seemed like a good option, but I wasn't sure I would enjoy it. Your review gave me the final push I needed and the book doesn't sound so bad now! Great review and thank you!